Karla and I have talked a lot about eating more Raw foods. We are both true believers in the virtues of Raw. Often though, since I am not quite immersed in the Raw lifestyle, I find some of the recipes to be a little complex or made with ingredients I don't have readily available. Therefore, Raw to me is often a carrot stick rather than a gourmet meal. This led me to find another Raw dessert that looks easy and sounds tasty. I have to admit I haven't actually made this one yet but it is on my list. If you try it first let me know if it tastes as good as it looks. I will let you know what I think as well. Let’s start with the frosting as it needs a few minutes in the fridge to set. Dump your cashews into the food processor/blender and process into a fine flour. Add in the vanilla, agave and half of the water into your processor/blender. Because this frosting is going to be thick, it can be hard to get it all mixed up by the blades. Add in more and more water (no more than the 1/2 cup) to thin it out and pause every few seconds to mix things up by hand. Be careful of the temperature of the frosting, it will heat up fast. Once you have the frosting mixed up, fill up your pastry bag, cone, press, etc. and set it in the fridge to firm up. Now for the brownie goodness. Dump the pecans into your food processor and process them down to a fine flour, then until it stops moving — some of the pecans will break down and release their oil and they will start to clump and turn into pecan butter (yum!). Give it a good stir by hand and then toss in the rest of the ingredients. Continue to process until the mixture forms a solid ball. Transfer to a bowl and give the dough a good stir by hand to make sure it is mixed well. Grab a small amount of the dough and roll into a ball with your hands. Press the ball down with your thumb to flatten it out and make an impression in the middle. Place the flattened brownie bite onto a plate. Prepare the rest of the dough in this fashion. Next, take your frosting out of the fridge and have at it! 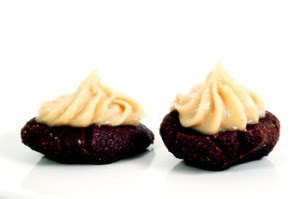 Fill up the indentation of each brownie bite with ‘a healthy amount’ of the frosting. These can be eaten right away, though the brownie dough is soft at room temperature. Put into the fridge for thirty minutes to firm up, or if you will not be serving them right away. What could be better than a healthy chocolaty dessert! This sounds absolutely delicious! I'm definitely going to try it! These are yum but very oily I added quite a bit of coconut and dried cherries and now they are setting on paper towels to soak up the oil.